The Advanced Fire Weather Forecasters Distance Learning Course addresses advanced training needs of Incident Meteorologists (IMETs), Fire Weather Program Leaders (FWPLs) in NOAA's NWS weather forecast offices (WFOs), and Regional Program Managers. These individuals are responsible for maintaining local fire weather programs and supporting all-hazards incidents onsite including wildfires, hazardous material releases, and incidents of national significance. The goal of the Advanced Fire Weather Forecasters Course is to prepare students to deliver specialized services to NWS customers and to manage local and regional fire weather programs. Advanced knowledge of mesoscale meteorology and fire behavior are necessary to better support fire management activities. After completion of this course, students will have a better appreciation for the needs of their customers and the intricacies of providing forecasts for specific fire events. This course addresses advanced training needs of Incident Meteorologists (IMETs), Fire Weather Program Leaders (FWPLs) in NOAA's NWS weather forecast offices (WFOs), and Regional Program Managers. These individuals are responsible for maintaining local fire weather programs and supporting all-hazards incidents onsite including wildfires, hazardous material releases, and incidents of national significance. This course consists of an orientation, nine core topics, and three modules that deal specifically with NOAA's National Weather Service fire weather services. The orientation provides an overview of all the components of the course. The core topics deal with the science of fire and characteristics of the fire environment as well as topics specific to creating a fire weather forecast. The NWS-specific topics detail the history and structure of fire weather services as well as how to best coordinate and communicate weather information to customers. To receive a course completion certificate, you must successfully complete the nine core modules which take about eleven to twelve hours. The total time to complete the entire course is approximately 18 hours. Occasionally, virtual conferences will be held on specific topics. For more information on the conferences, please contact your Regional Fire Weather Program Manager. 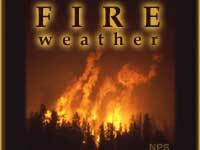 The first Fire Weather Virtual Conference was held in April of 2008. For more information, please contact fire_wx@comet.ucar.edu. MetEd courses consist of a selection of lessons in a particular area of interest. When all lessons in a course have been completed, a printable course completion certificate is offered. Access to our courses and lessons requires registration. To learn more about registering or to get help with common questions about our site, please visit our FAQs.